While I am not a big breakfast eater myself, I do like to have something around once in a while that goes nicely with my coffee in the morning. Very often I will make an easy banana bread, which is tasty, but I was looking for something a little bit different to try to that had some different flavor to it but would still be easy to make. I was also looking for a use for some of the whole wheat flour I had bought to make brown bread for St. Patrick’s Day. 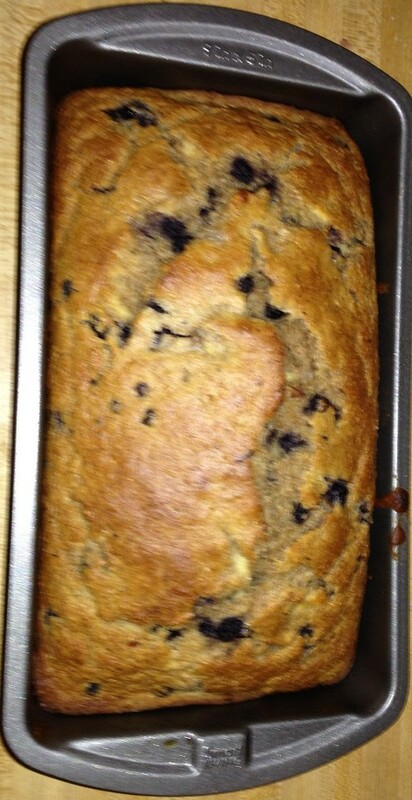 So I was quite fortunate when I came across this recipe from Kitchen Daily for a tasty banana-blueberry buttermilk bread that was simple to make. Preheat the oven to 375°F. Coat a 9-by-5-inch loaf pan with cooking spray. Whisk the buttermilk, brown sugar, vegetable oil and eggs in a large bowl. Stir in the mashed bananas. Whisk the whole-wheat flour, all-purpose flour, baking powder, cinnamon, baking soda, salt and nutmeg in a medium bowl. Fold the dry ingredients into the wet ingredients and stir until they are just combined. Fold in the blueberries. Transfer the batter to the prepared pan. Bake the bread until the top is golden brown and a wooden skewer inserted in the center of the bread comes out clean, about 50 to 60 minutes. Cool the bread in the pan for 10 minutes, then turn it out onto a wire rack. Let the bread cool for about 2 hours before slicing. You could also make these as muffins if you prefer to have muffins instead. For the muffin variation, preheat the oven to 400°F. Coat 12 (1/2 cup) muffin cups with cooking spray or line the cups with paper liners. Divide the batter among the muffin cups (they will be full). Bake the muffins until the tops are golden brown and a wooden skewer inserted in the center of a muffin comes out clean, about 20 to 25 minutes. Cool the muffins in the pan for 10 minutes, then remove the muffins and let them cool on a wire rack for at least 5 minutes more before serving. One other note about this recipe. the original recipe calls for whole-wheat pastry flour instead of just whole wheat flour, which I did not have. The whole wheat pastry flour has less protein than regular whole wheat flour, so you will get less gluten in the results and it will make for a more tender bread or muffin. If you would prefer to go that way, then use the pastry flour instead. I think the results came out just fine with the regular whole wheat flour. I liked the flavor to go along with the mix of the bananas and blueberries and it was great as a breakfast with my coffee in the morning. it gives a nice, different and easy option for something like this or to make quickly when you are having guests at the last-minute or need something to bring to someone’s home.